Budgies usually get along with each other and rarely fight. But there are times when they need to warn other budgies off, like when they claim ownership of a nesting site, or when there's a courtship rivalry. The way budgies warn each other off is usually through body language and threatening behavior. The budgie will try to make itself appear big by standing up straight and extending all its joints. Then the budgie will sound a warning call and maybe hack towards the offending budgie. Almost every time the offending budgie will move away and everything will end peacefully. Sometimes though, the offending budgie will stand up straight and try to threaten the other budgie back. Now, as far as I know, there hasn't been a single recorded case of budgies fighting in the wild. And I can't blame them. They have to work hard enough to survive in the desert like conditions without fighting with each other. There are a fair number of recorded cases of budgies fighting each other in captivity though. It's probably a result of having to live so close together all the time. If two budgies see each other as threatening their survival for whatever reason, and they're stuck in a cage or aviary together, then fighting is probably inevitable. Two budgies that have bonded and accepted each other won't fight. They'll be happy living together and respect the other's need for space. And male budgies will almost never fight females. Female budgies are usually more aggressive than males. Conflicts will often happen when there are more female than male budgies in a group. The females tend to see each other as rivals, even if the male budgie is already bonded with one of them. So, make sure that you either have equal numbers of male and female budgies or more males. The other time that fights are more likely to happen between pet budgies is when they want to mate. You can avoid aggressive competition over nesting sites by making sure that there is plenty of choice of nesting boxes. And by making sure that the nesting boxes are spaced out at least three feet apart. If the nesting boxes are too close together both pairs of budgies will feel threatened by the other pair. Budgies aren't really equipped that well for fighting. They don't fight their predators in the wild, they just run away. So, when budgies do decide to fight all they've got as a weapon is their beak. And it's not a particularly sharp beak compared to a lot of other birds. When they decide to fight, one budgie will approach the other and try to bite at its feet and pull its feathers. The other budgie will try to use its beak to block the attacker. The fight usually lasts until one of the budgies decides to run away. It's very rare indeed that one budgie will continue attacking after its opponent has decided to flee. If that happens all you can really do is try to separate them before there is any serious injury. Spending a few minutes chatting with a talking bird can brighten your day, and adding a bird to your family will provide a fun opportunity to enjoy the bonds that form when your feathered companion can talk. Many types of birds love to talk and their styles can vary according to their species as well as their temperament. While some birds may be able to memorize a few words, others can carry on full conversations. Here are the top pet bird types that have the ability to learn to talk along with their defining characteristics to help you decide which one will best fit your lifestyle. Conures are known for having the smallest vocabulary out of the parrot family. However, what they lack in words, they make up for in personality. 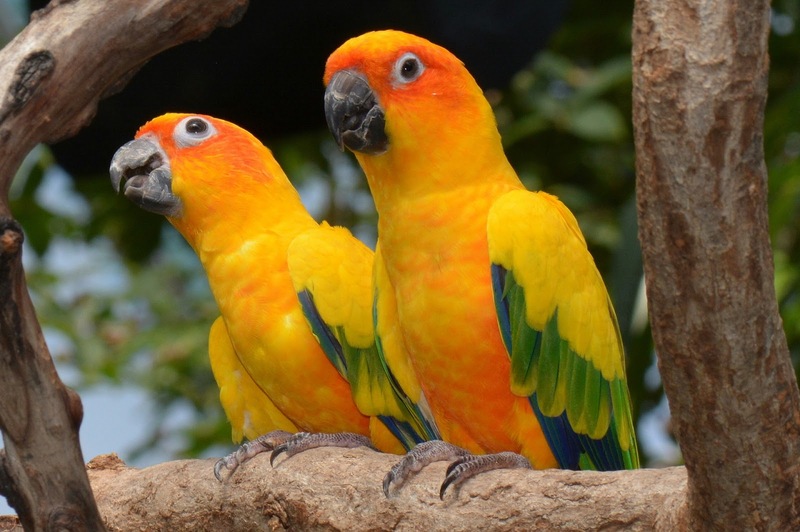 Conures have a loud, attention-getting voice, and they sound more like a bird than other species. Although they can reproduce the human voice to some degree, you may also hear them chatter in bird talk while maintaining a human-like rhythm. They also have a surprisingly strong ability to mimic many different kinds of sounds, and your conure can keep you in giggles as they sneeze, chortle and chuckle. Quakers have tons of personality and many bird lovers claim that their quaker can respond as if they understand the entire conversation. Perhaps this is due to their impeccable timing, which indicates that they may have some understanding of the intricacies of human language. For example, you may find your quaker telling you "good night" as you turn off a light, or they may say "thank you" when you give them some food. Quakers are full of surprises and this is one talking bird that can keep the one-liners coming. Budgies often get overlooked when it comes to talking birds, but according to the Guinness Book of World records, a budgie has earned the distinction of being "The Most Talking Bird" with a vocabulary of more than 1700 words. If you are considering getting a budgie, then be sure it is a male since females do not talk. Additionally, budgies pick up new words from their environment and are constantly adding to their vocabulary. Try leaving the radio or television on during quiet periods of the day and you will be amazed at how much your budgie can learn to say. African greys are quieter than a conure, yet they also have the ability to reproduce different voices depending upon whom they are mimicking. For example, your African grey may sing a song in the voice of your favorite musical artist, or they could squawk "hello" in your kid's voice so well that you think they are in the room. As you teach your grey to talk, keep in mind that they learn words faster when emotions are attached to them. So, get excited when you tell them hello or call them a pretty bird. Talking birds are a great addition to any home, and you can spend hours training your bird to communicate effectively. Whether you prefer a chatterbox or an occasional bit of birdie wisdom, there is a type of talking bird that will fit your preferences. Just remember that talking to your bird frequently is the best way to expand their vocabulary which means that you can get started from the moment you bring your new bird home. Are you sure that you need a BUDGIE? Budgies in natural conditions live in flights and it will be boring for one budgie to live in a cage. His friend, who can replace the company of other bird, could be a person but only in the case that he spends lots of time with his feathery friend, speaks to it and lets it fly. If the bird is alone most of the time it becomes sad and very often gets sick. If you are unable to spare enough time for the budgie or if the family is absent for a long time, it is better to start breeding a couple of birds. 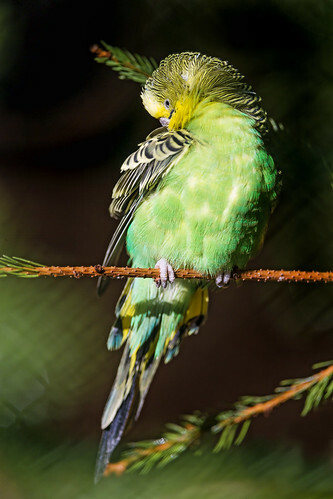 Many people think that when living in a couple budgies do not become domestic because they do not need human presence anymore. But if your patient enough and if you have enough time you may breed budgies separately while they grow up until they become domestic and start perching on your arm and only then to bring them together into one cage. It can happen that on some days you can be very busy and to be unable to care about the birds It is very important someone in the family to take care of them. And will it be possible for the bird to move around your home? Home budgies do not need to look for food alone and to fly kilometers away but they also have to “exercise” their wings. These feathery ones will not be vital and healthy if they do not fly daily around the room at least for an hour. But is very difficult to keep the cage in one room with a cat–it instinctively chases birds and the is no trouble in catching the flying budgie. But an obedient dog very soon realizes that the bird is a member of the family and that it must not be disturbed. Whether you are a parakeet breeder or you have just a single budgerigar parakeet, understanding his or her behavior can give you big headaches. Before buying a budgie you should inform about his health and read about budgerigar behavior. Otherwise, it is possible to buy a sick budgerigar and your efforts to understand your companion will be in vain. You should know that budgie care takes time and understanding. Consult a book about parakeets or read various articles on the Internet, such as this one. Sometimes, the budgie may scream. This will happen when something is missing to your parakeet. Parrot screams are stressful and annoying. We need to understand their needs quickly. One reason could be the lack of food. The basic food is millet, but budgie can eat oats and sunflower seeds. 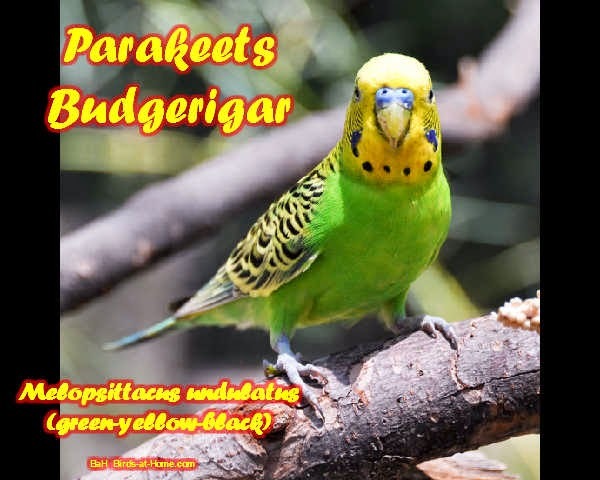 As fruits and greens, you can give your budgerigar apple, banana, parsley, and dandelion. Another reason is that the budgie likes to bathe. The bath cools them, helps to get rid of dust and more than that cheers them. Sometimes, budgie stretches one leg and wing on the same side with the leg. We can compare this movement with human morning stretch. Thus, budgie relaxes his fingers and body. To scare the enemy, budgie swells the feathers to look more impressive. Raises his wings and open his beak and begins to scream. Another reason is to conserve the body heat and to get warm. Sometimes, budgie raises the wings when he feels too hot. If the bird frequently yawns it means that is not enough fresh air and you have to ventilate the room. The budgie can sneeze. This allows him to clean the nostrils. Budgies hate to be left alone, to be kept in small, dark spaces, not to receive enough affection, to be scolded or beaten, to have unwashed cages, not to get food and water when needed. Instead, budgies love to be constantly with the owner, to be loved and to play a lot, to have many toys and to be rewarded from time to time with goodies, to be kept on the finger or shoulder, and to have a clean cage. No matter what your parakeet is doing wrong, do not ever hit him because he could no longer trust you. On the contrary, the relationship with your companion must be a strong one. Birds usually do not understand hitting, spraying with water, screaming as corrective methods. A very interesting fact is that the budgie is strongly influenced by the outside atmosphere. If the morning is gloomy and rainy, your parakeet will be quite upset and apathetic, if he sees the sun, will be happy all day long. 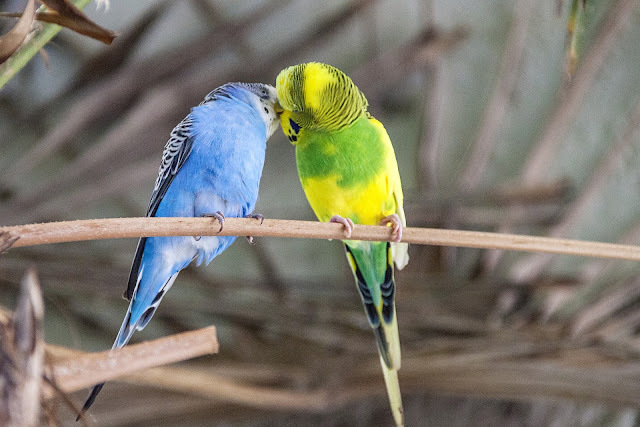 Discover more about budgie breeding and get some budgie care tips that would help you to create a strong relationship with your companion. Budgie parakeets can make wonderful pets if you know how to keep them happy. A lot of people assume that in order to keep their pet parakeet happy, all they need to do is give it food, water, and a clean cage to live in. Unfortunately, that's not the case. Parakeets have a variety of special needs that can be best understood by taking a look at how wild parakeets behave in their native land of Australia. Parakeets evolved for life in the great Australian Outback. Life in this arid desert-like landscape is not easy. Temperatures can reach well over 100°F, food is scarce, standing water can be very difficult to find, and predators lurk in the skies as well as in the underbrush. In order to help deal with these harsh conditions, parakeets have developed some unique adaptations. Most large parrots need access to a huge variety of nuts, fruits, and vegetables in order to be healthy. These things are not readily available to the parakeet. Because of this, the parakeet has shrunken in size compared to other parrots and lives almost entirely off of grass seeds. Grasses are a dependable source of food in the Outback because they can grow even with very little water. Even though parakeets mainly live on grass seeds, it's important to note that they feed on over 20 different kinds of grasses. This variety helps them get all the nutrients they need. It's important that you provide your pet parakeet with a large variety of seeds as well as formulated pellets in order to keep your pet healthy. Parakeet bodies have been streamlined to preserve water. If the humidity is high and the temperatures are cool, they can go without drinking for over a week and hardly show signs of fatigue. If you or I were to try this we would die within just a few days. Because parakeets drink so little, it's important that you keep your bird's water bowl clean and fresh by switching out the water every day instead of just waiting for your bird to drink it all and then refilling it. If you let the water stay for several days it can grow bacteria that can kill your parrot. Parakeets are not built for long distance flying. Instead, they enjoy powerful bursts of flight for short distances. A parakeet can take off almost immediately if he thinks his life is in danger and his incredible maneuverability makes him almost impossible to catch, even for stealthy and agile predators like the peregrine falcon. Even though parakeets typically only fly in short bursts, they are nomadic (they never stay in the same place for very long) and during the course of just one day they may end up covering more than 10 miles in their search for food. Your parakeet needs time outside of his cage every day in order to fly around the house, climb on things, and do a little exploring to get his wiggles out. Make sure the parakeet cage you buy is large enough for your bird to fly in without snagging his wings on the walls when he gets excited or frightened. The smallest cage for a single bird should be no less than 2 feet long. Also, make sure that your bird has toys to climb on and chew up in order to get some exercise. Parakeets are flock birds that are never seen alone unless they are sick or have gotten lost in their clan. Parakeet flocks can be as small 5 to 10 birds or larger than 10,000! Flocks shrink and grow depending on the availability of food. When times get tough, large groups will break into smaller flocks to avoid fighting over patches of grass when foraging. The flock provides parakeets with safety from predators as well as a place to make friends and find a mate. Because parakeets are such social animals, your bird will need several hours of attention from you each day unless you have several parakeets to keep each other company. A lonely parakeet is a sad and frightened parakeet. The parakeet's Australian name is "Budgerigar" which means "Little Snack". These poor innocent creatures can be found on the dinner menu of almost every meat-eating animal in the Outback. Because of this, they are horribly scared of almost anything that moves, including humans. It's important that you carefully earn your parakeets trust before attempting to handle your bird. Never hit your parakeet when he does something wrong and never leaves your bird alone with a dog or cat. Now that you know a little more about wild parakeets, I hope you will be able to make your pet parakeet feel a little more at home in your family. Good luck to you! Pet birds are a blessing for many people. They're the ideal pet because they require minimal space, no outdoor access and little work from their owner. They're also cheap to buy, cheap to look after, and an all-around low cost, low maintenance pet. They provide companionship with minimal effort, whether you live on a farm or a flat on the 13th floor of an apartment block. Some pet birds talk, of course, making them even better company than the average pet: you couldn't teach your Labrador to say hello and ask who the pretty boy is. Teaching pet birds to speak is part of the charm of owning pets- it provides an extra level of companionship as well as a potential additional hobby. If you're looking for a pet that is low maintenance, clean around the house and takes up little space, then it's probable that owning a pet bird will suit you. 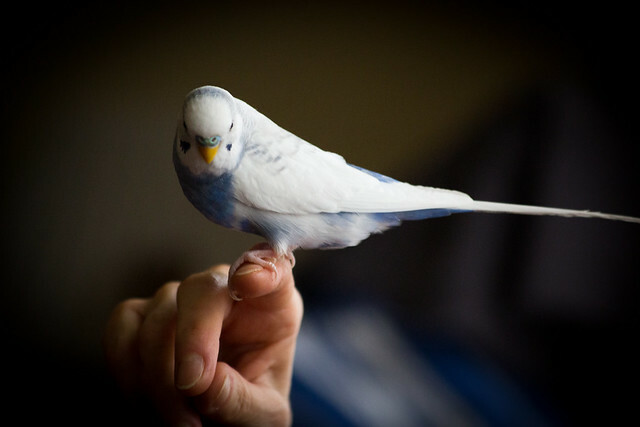 And if you want your pet bird to have the potential to learn to speak, then you should be looking at budgies or cockatiels for sale in your area or online. "Budgie" is short for budgerigar, which is also called the common pet parakeet. Native to Australia, the budgerigar, or budgie is closely related to the parrot. Budgies are hugely popular around the world as a pet, particularly in the UK, where their playful disposition, attractive markings, and ability to ape human speech. The chances are that you know somebody who owns a budgerigar, so if you're interested in getting a budgie it would be an idea to investigate further by meeting and handling a friend's pet budgie, or for visiting a pet shop that has budgies for sale in order to handle one of the birds and learn all you can before deciding whether budgies are for you or not. Cockatiels have a huge popularity across the globe, second only to that of the budgerigar. Cockatiels are part of the cockatoo family, and it's the smallest member. Much like budgerigars, cockatiels are well known for their distinctive and attractive appearance and their ability to "speak" human words. Similar to budgerigars, cockatiels are hugely popular because of their relatively small size and the commensurately small amount of space needed to cage them. If you're looking for cockatiels for sale then it's possible that you might find the cheapest price for cockatiels on the internet, but before making that purchase you would be well advised to research for these birds for sale elsewhere. Visit a local pet shop that has cockatiels and speaks to the trained staff there, and learn all you can about the animal. What will they eat? How long can they be left alone? How big will their cage need to be, and what is it likely to cost? Is finding just one cockatiel going to be okay, or do they need to be kept in pairs for company? All these small factors should be considered when you're looking at cockatiels as a pet. The staple food of budgies in the wild is usually grass seeds. However, in captivity budgies thrive well on a diet of seeds, millets, whole grain bread and sprouts. A varied diet provides all essential nutrients and keeps the budgies well nourished. A varied diet also prevents obesity as opposed to a diet exclusively on seeds. Place the seeds in a flat dish so that it is easy for removal The feeding can be done once a day. Seeds which have not been eaten by the budgies can be reused. Just blow over the feeding dish to remove the husk and then top up the remaining seeds. Budgies also love coriander leaves and greens. Beetroot, spinach, lettuce, and cabbage may also be given. Put these leaves into the cage and watch the budgies tear them up into little bits as they eat them. Give only fresh leaves as old or refrigerated leaves may cause digestion problems for the budgies. Remove any leftovers from the cage. Do not give Avocados, chocolates, apple seeds, coffee, tea, tomato leaves, peach seeds, eggplant, peanuts, etc to your budgies as these contain substances which can prove to be toxic to the budgies. Budgies need fresh water every day. Keep a constant supply of water in the cage. Replace the water if it has become soiled. Special water dispensers suited for birds are available. This prevents the water from getting soiled. In the wild, budgies descend in large groups over water bodies. They love to bathe. You can keep a shallow bowl of water and watch them bathe. Bathing water can be provided twice a week. Budgies, especially female, need calcium as they lay eggs. Calcium deficiency can cause a dangerous condition called egg binding in female budgies where the eggs, having soft shells due to lack of calcium, get stuck in the vent, causing death. Hence, it is vital that the diet the budgies eat contains a lot of calcium. The Cuttlebone is a common source of calcium. Cuttlebone, as the name suggests, comes from the cuttlefish. It is available in all pet stores. The cuttlebone may be placed inside the cage. Some pet owners prefer to crush the cuttlebone into powder and add to the budgies' food. You can also provide other sources of calcium for your budgies such as broken eggshells and commercial calcium supplements which are available in the market. Another alternative would be to use mineral blocks. Mineral blocks are supplements which contain calcium as well as other ingredients such as phosphorus, zinc, Iron, Magnesium, etc necessary for the health of the budgie. From the smallest parrots with great popularity among the lovers have budgies – their weight reaches up to 40 grams, and the length of their body is no more than 20 – 23 cm. Usually, cages for budgies are sold equipped with perches, made of wood or hard plastics. But after that the owner of the feathery ones has to complete the interior with several real, rough, unattractive twigs, because if the budgie never changes the position of its toes and always holds tight to the flat and smooth surface of standard sick, its toes start swelling, rubbing sore and there start to appear wounds and scabs. If you don't have fine sandpaper to cover the floor, you can spread out under the layer of very fine ballast (or very coarse sand ) and an ordinary newspaper, which must not have colored illustrations. Most printing inks are poisonous for budgies. Something more that can threaten your birds is using twigs from the coniferous tree – yew, whose wood is also poisonous for birds. It is best for this purpose to use twigs from orchard trees. My recommendation is to use transparent feeders – thus it will be easier for the budgie to find its food when it sees the food. Feeders must be of two types – one for seeds and sand with stones and another bigger one for the vegetation and fruit. The sand could be from the sea, mixed with crushed shells and mussels ( but not from the white one that is sold for the Canaries), and the stones should be from granite or flint. Budgies get bored with the same toys, so it is better to change or to take turns of them into the cage. It is considered that a mirror makes the loneliness of the bird more endurable – looking into the mirror the bird start imagining that it is not alone, but I consider that constant looking in the mirror is not recommendable because of a danger of inhibition. Choose the most spacious cage, which you can afford and which you can dispose at home. 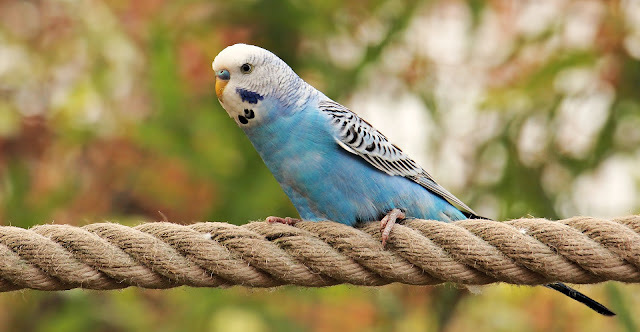 It is considered that the ideal size of cage for a couple of budgies is 91/45/45 cm, and when only one bird is going to live in the cage its size could be 2/3 from the stated one. Don't be in a hurry with you purchase – many cages are sold in the zoo shops, but you can have the chance to buy a suitable already used one. Different constructions exist, so it is sensible not to hurry so that you can buy something really good. You buy a home for your budgies, where their life will pass, so do your best to choose such, where they will feel best. Choosing a cage it is not bad to think about some things. Is it spacious enough? Is its shape proper – you might like a high circular cage, but in “ lodgings ” birds very often don't have enough room to move and to outspread their wings. It can seem less important, but closing the door must be secure. There should be a mobile plastic bottom in the cage, which to ease cleaning it. 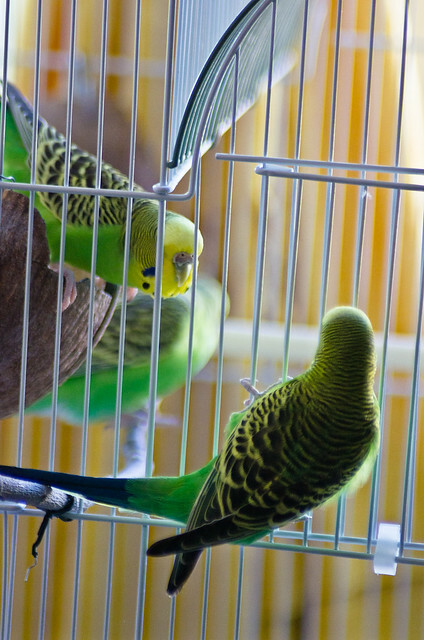 The sticks of the cage can be chromium plated or glazed and it is good to have horizontal not only vertical sticks on the sides of the cage so that the budgies can climb easily. The perches must be located so that birds can reach all feeders and watering troughs and place one higher than the other ones. Don't install them near the sides of the cage, because staying on them, budgies will constantly rub their tails on the metal sticks. Prepare the cage before buying your feathery friend. And when you take it from the shop, put it in a cardboard box, handle it with care and quickly take it home. If it is cold outside wrap the box, but so that you don't reduce air flow. At hoe wash the whole cage with very hot water, but neither use soap nor washing detergents, use only special disinfection means, that are intended for birdcages. This is absolutely compulsory if you have obtained a used cage. Dry very well the new home of the bird. Place a sheet of very fine sandpaper on the bottom and spread fine ballast. After that, install the perches, feeders and water troughs. Birds don't like the location of the cage to be often changed, that is why choose the most proper place for them in your flat right in the beginning. The place should be lighted up enough, but not to be lit up directly by sunlight. If you have a glassed balcony from late spring to early autumn you can keep your birds there. You can put pots with big - leaved plants around the cage. Thus birds will feel well. The balcony should not be facing south, because during the hot summer days the bird can die of overheating. When temperatures get lower you should bring the bird inside the flat Watch out not to put it near the central-heating or other heating devices because air is drier there. When you bring the birds in be careful because of the make lots of mess around especially when they start flying in the cage. It is known that budgies like to have company – your feathery pet will feel best in the room where the whole family gathers. Choose a room, where you can let the bird fly free –this is very important for its education. Budgies also need fresh air – that is why the room should not be stifling. Exactly because of this reason the cage of the birds should not be put in the kitchen as some beginners do. The steam that appears when cooking is harmful to birds. Except for that, it is very dangerous when flying in the kitchen the budgie to have a tragic end. The cage should not be put in front of the window – there the sensitive feathery creatures very sensibly feel the atmosphere changes – the cold in winter and the burning sunrays in summer. The cage should not be exposed to draughts, very close to the radiator of the central heating or near the fireplace. Whether the cage is placed on a special for this purpose rack is not very important – it could be placed on every solid table or shelf. But on a special rack the cage takes less space, it can be put higher, which the birds will like and it will be easier to move it. Budgies suffer if they don't sleep enough. That is why you should cover their cage with a light material – it reduces light, but birds don't stay in full darkness. This is a young domesticated budgie. His name is Chief! These days there are many super nutritious pellet mixes around for budgies, but owners often have trouble getting their budgie to actually eat them. And if your budgie isn't eating it, it doesn't matter how healthy the food is. You see, the problem is that budgies don't see pellets as food. Pellets are artificial, and budgies haven't evolved to see pellets and want to gobble them down. And, unlike many other animals, budgies can't just sniff the pellets and realize they're full of nutritious stuff. Obviously, it wouldn't be a great survival strategy to just eat things that you don't recognize as food so it can take some convincing before your budgie will eat them. So, let's look at three strategies to move your budgie over to pellets. These aren't miracle fixes, but they do work, with a little effort and patience. The first strategy is pretty straightforward, you mix pellets in with some irresistible food, and wait for your budgie to accidentally nibble on a pellet when they're trying to get at the other food. The idea is that once your budgie finds out that the pellet is edible, and tastes good, they'll have no problem eating them in the future. This can take a lot of patience, as your budgie might go weeks without touching the pellets, but they will do eventually. And, once they start eating them, they'll realize they're food forever. It might seem kind of silly, but if your budgie is bonded with you, it can help if your budgie sees you eating the pellets first. If their surrogate mate is enjoying the pellets, nibbling on them and making yum sounds, they'll often be enticed to try some themselves. This strategy also works to get your budgie started on fresh fruits and vegetables, in case you're having trouble with that, as many people do. Bird food pellets are perfectly safe for people to eat, although I don't whether you'll enjoy the taste of them. But still, you don't have to eat them forever, just until you manage to convince your budgie to try them. Another option is to gradually replace their seed with pellets, every three days adding ten percent more pellets. So, the first three days your budgie has 90% seeds, 10% pellets. The second three days they have 80% seed, 20% pellets etc. The whole conversion will take roughly a month. When working with animals things don't always go according to plan though, so if you get a week or two through the conversion and your budgie isn't touching the pellets, start at the beginning again. If you don't, your budgie could become dangerously underweight, since they don't carry fat reserves. For most birds, though you'll find your budgie is eating pellets just fine without your having to restart the cycle. Whichever strategy you decide upon, the name of the game is patience. You're trying to get your budgie to do something deeply unnatural, eat something which isn't food, and some birds will take a lot of convincing to do that. The reason for your budgie's problem is the lack of vitamins and minerals. As a beginning take it to the vet to cut the growths and to file away the curved beak. Don't try to do this yourself - it should be executed by a specialist. The next step is to buy a crayon with vitamins and minerals for it from the zoo shop. You also have to provide pine-tree twigs for it to gnaw. When there is no crayon you can replace it with chalk. It is absolutely necessary for the birds. Take one capsule tetraulean / from the chemist's /. Open it. Take some powder from the capsule to the point of a small knife. Dissolve this very small dose of 1-2 drops of water. After that open the beak and pour the liquid carefully inside with a dropper. The treatment should be applied for 3 days most. After that, the faecal will obtain their normal kind. Be careful not to overdose the tetraulean. Except for that even if the parrot has no cold you should compulsory buy vitamins for it from the zoo shop. Another reason for this condition of the feathery creature can be starvation because with a deformed beak it is most probable that the bird can't eat millet. And only vegetables and fruit is not enough. Give bread to your budgies as they like it a lot. The light green budgerigar is the original native specimen and the others result from selective breeding of mutations. There are now thousands of possible color variations. The crested opaline cobalt budgerigar is one of the budgies with a crested mutation - this crest of feathers on top of the head is quite distinctive and looks like a flat-top haircut. The cobalt coloring is very impressive and is enhanced by the opaline pattern of the plumage. This parrot lives to around seven years and grows to around seven inches. The gray budgerigar has not only gray plumage but also gray feet. Like most other budgies it grows to seven inches and lives for around seven years. It has a white head and a series of notable black spots between the head and gray body. The gray-winged sky blue budgerigar's mutation of gray wings was first identified in 1918, and the way these blend with a sky blue breast make a very attractive bird. The birds face is white or yellow. You can identify the female by the brown cere. The light green budgerigar with its yellow head and green body is the classic budgie which you can see in is a native habitat of Australia. 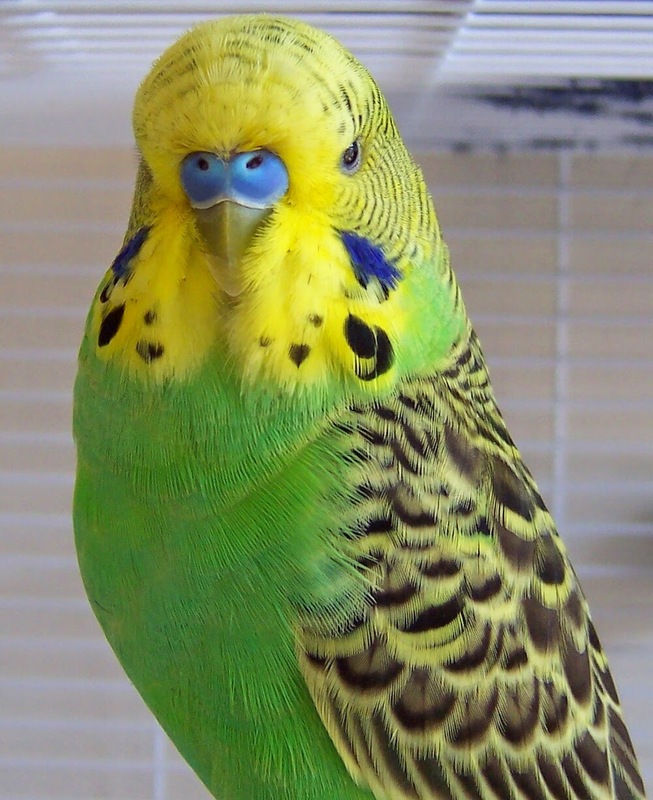 The lutino budgerigar's bright yellow plumage capture's many an owner's hearts. It is the absence of melanin that means that there are no black spots. Looking closely you will note that the wing feathers are lighter than the rest of the bright yellow body. The impressively named opaline dominant pied budgerigar (melopsittacus undulatus) can have a variety of different markings from light through to dark green. It first emerged in 1935, and you will often see three distinctive markings on the side of their face. Danny Oakes writes about all different types of parrots such as the Meyers Parrot and all aspects of parrot behavior such as parrots talking. Should I Get a BUDGIE? Taking a budgie home is a big responsibility. You're wholly responsible for the well being of your new pet day in, day out. And that will still be true once the novelty wears off. At the risk of sounding like a spoil sport, there are a few things you need to consider before you bring a budgie home. Taking care of a budgie's basic need doesn't take up a massive amount of time. But it does take a little of your time every day. A budgie needs fresh food and water, a clean cage and regular companionship. In the wild budgies live in huge flocks. And within the flock, they have an immediate family that they are very close to. It's a common myth that a budgie alone in its cage will be happy. The truth is that they are very social animals that have a deeply ingrained need for company. As your budgies adopted the family you will have to spend a decent amount of time with it if it's housed alone. Otherwise, it's likely to get depressed. Now, budgies aren't expensive pets to keep. Far from it. But there are costs that come with owning any pet. The obvious initial expense is a decent sized cage, but you've probably already realized that. A regular supply of food, sandpaper, grit and mineral blocks does add up. As well as the need to buy new toys every now and again, so your budgie doesn't get bored with them. It only costs a couple of bucks to buy a budgie, but then it's your duty to make sure you can look after it. Is A Budgie The Right Pet For You? While budgies are great companions that can bring a lot of joy into your life, they're not right for everyone. A relationship with a budgie is much more hands off than a relationship with other pets. Budgies will sit on your finger and let you stroke them for some of the time, but they're certainly not pets that you can have a very physical relationship with. So, if you're looking for a pet that you can cuddle and stroke often, then you are probably better suited to owning something furry. Noise is also something that you need to think about. Are you going to get irritated if your budgie squawks all the way through your favorite TV or radio show? If there's a steady stream of sound, like a conversation going on in the room, you budgie will often join in. Also, a budgie tends to create a fair amount of mess. Feathers and seed husks will usually litter the floor under and around your budgies cage. And when your budgie's flying around the room it'll leave stray feathers all over the place. This means that you'll likely find yourself needing to vacuum slightly more often than you do at the moment. You'll often hear tales of a small bird being introduced to a cat, and of the cat getting on well with the bird. Of the cat taking a curious interest and then leaving the bird in peace. It sounds cute and it probably does happen. But it's the exception rather than the rule. Generally, if you have larger animals like cats or dogs they'll need to be kept apart from your budgie. Since your budgie needs time every day outside his cage, you'll need to house him in a room that you're happy to lock the cats and dogs out of while your budgie flies around and explores. Budgies can be housed with quite a few different species of bird. They're not suitable to be kept with all types of pet bird though. You might be thinking about getting a budgie primarily for your child. If you're child wants a budgie, that's great. They're good pets. And your child can learn about responsibility as well as gaining a loving companion. However, children generally like to be hands on with their pets. The younger they are, the more hands on they tend to be. So your child will need to be taught how delicate a budgie is and supervised when handling it. Lastly you should remember that as the adult you have the primary responsibility for the budgie's welfare. Your child might want a budgie more than anything in the world right now, but what about in six months time? Are you prepared to look after the budgie in the years ahead, if your child gets bored of it? Author: Brandon Westfield - Article Source: EzineArticles - Should I Get a Budgie? It's easy to get into bad budgie care habits. But these bad habits that are easy for us to live with are hard for your budgie to live with. Your bad habits can hurt - or even kill - your budgie. 1. A huge mistake is feeding your budgie an all seed diet. Budgies need more than just seed mix to stay healthy. Giving your budgie just seed is like you only eating turkey. Turkey might be good food, but you wouldn't stay healthy if that's all you ate, right? Now, when you bring a budgie home it's probably only been fed seeds so far. So when you give your budgie other food it rejects it. That's a natural reaction. If you'd never seen a potato before, you would be a little suspicious of it when one turned up on your plate. The truth is no animal that has a poor diet will be very healthy or live as long as it could do. A mistake that's not so obvious - but just as deadly to your budgie - is exposing your budgie to sharp temperature changes and drafts. Sitting your budgie's cage next to the window, so it can have a pretty view and watch the birds fly by is actually dangerous. You see, constant droughts will likely make your budgie ill. And a budgie that picks up a chest infection can go downhill very fast. Also, the heat can kill your budgie. If your budgie's cage is getting the full heat of the midday sun it's easy for your budgie to get dehydrated. If there is no shade in the cage then your budgie has no choice but to sit there while the heat makes it uncomfortable. Budgies might be hardy animals, but there are some conditions they just aren't suited to living in. You might not have even considered this one. Your windows are dangerous to your budgie, and so are any glass doors. When you let your budgie out of its cage and it flies around, the budgie often doesn't realize that the glass is there and tries to fly through it. This isn't just dangerous - it can be deadly. Sorry if that sounded kind of melodramatic, but I'm being serious here. Loads of budgies break their neck flying into windows. Not to mention shattered beaks and other injuries. Sadly more budgies die this way every year. Hopefully, your budgie won't be one of them. When taming a Budgie it takes lots of your time and patience. So as to tame this bird, you need to develop a bond of trust between you and your pet. Keep in mind that you just are larger than your Budgie Bird, and it's doable for him or her to feel vulnerable by your size. By developing your relationship slowly with lots of patience, ease and heart, your pet bird will become one in all your nearest friends in no time. If you like your budgerigars, then you wish them to own an extended and happy life by your aspect. Sadly, there is a ton of confusion and content around what makes a healthy budgerigar diet. And, as we tend to all grasp, a balanced and wholesome diet is crucial to staying healthy. The truth is that budgies want a lot of identical diet as people to be healthy. Wherever we have a tendency to eat wheat, corn or potatoes, they'll have seed or pellets instead; however they have an honest mixture of recent fruits and vegetables, a bit like we have a tendency to do. 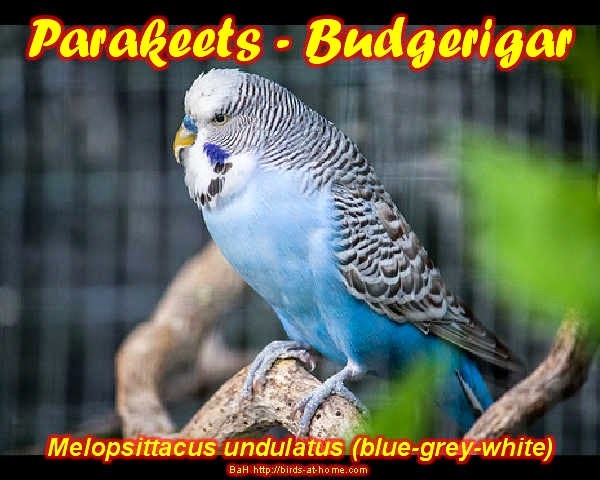 In the wild budgies feed virtually completely on ripening grass seeds and nourishment, however ripening seeds have a distinct nutritionary content than absolutely mature ones. Browse on to find out the way to tame this type of paraquet. Things you'll need when you want to tame your pet parrot this are Affection, Patience, Trust, and Love. Begin your Parrot Training with 10- to 15-minute sessions every day. These are going to be the tools to assembling a bond of trust. Visit your bird by his cage at concerning an equivalent time daily. Speak softly thereto, and leave your hand before of the cage in order that he or she will see it. Do not wave it with any huge motions; however simply leave it still in order that they'll see it. Ensure that you simply are not on the move lots throughout your initial few times of coaching. Begin slowly gap the door to your budgie's cage when regarding four to seven days of simply approval your bird. Initially the parakeet might act afraid, however with time and your trust, he or she is going to slowly begin to open up. Begin simply by departure your hand within the cage while not truly swing it closes to the bird. The concept is to let your parakeet get accustomed having your hand within the cage. Hold your hand close to your shell parakeet once he or she has learned to trust your hand. Approach your bird slowly, so it doesn't scare him or her. Use your index as a perch for the shell parakeet. If all are properly done this type of parrot become a great pet. Allan Wilkinson is working as an author of Bird training .